Bacon remains a popular staple among consumers and food manufacturers. Consumers are paying higher prices for bacon, but that isn’t stopping them from indulging in the multi-daypart staple – or the food industry from developing new bacon-centric products, promotions and menu items. Retail prices for bacon advanced significantly in 2017 on tight supplies of pork bellies in cold storage. An American Farm Bureau (AFBF) Marketbasket Survey from last September found that wholesale prices for pork bellies had surged more than 70 percent in 2017, while retail prices for bacon jumped more than 60 percent. 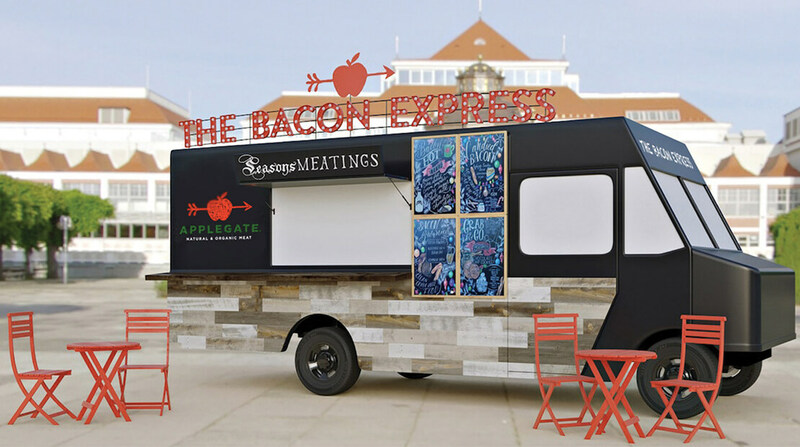 Season’s Meatings was the theme of Bridgewater, New Jersey-based Applegate’s holiday campaign that featured The Bacon Express, a pop-up food truck that traveled to select East Coast cities as part of a two-week tour serving complimentary bacon treats created by Chef Ian Knauer – from candied bacon to bacon hot chocolate. The tour finished at New York City’s Radio City Music Hall featuring the “Christmas Spectacular Starring the Radio City Rockettes.” Applegate was an official partner of the Rockettes’ show.